Calhoun should depart with dignity — in 2014. I’m writing this before I read anything about Thursday night’s disturbing game in which Iowa State bounced UConn from the NCAA first round, 77 – 64. The Huskies looked unnerved and poorly coached. Andre Drummond showed that he has no clue about offense after spending a full year under his Hall of Fame Coach. Alex Oriaki was out-of-synch when he got near a rebound or his own basket. Jeremy Lamb stayed in his shell for 25 minutes, waiting for someone else to step up and be the best Husky on the floor. Ultimately, the poor performance is Calhoun’s problem, not the players. Connecticut is out of the Big Dance and standing at a crossroads with Jim Calhoun. Should he stay or should he go ? Left to his own devices, Jim will never leave. The ego is too big. Jim seems unconcerned with making a classy exit. When Dean Smith retired from UNC in 1997 he left with dignity – and 2 National titles, 11 Final Fours and a record 879 victories. He produced NBA stars, D1 Coaches, good students, and Michael Jordan. Smith was 66 years old at the time. He left with a squeaky clean reputation. There are similarities between the accomplishments of Dean and Jim. Jim will be 70 years old on May 10. He has 866 career Div 1 victories. His UConn dossier includes 3 National Titles, 1 NIT Title, 4 Final Fours, 27 NBA players, and 4 D-1 Head Coaches. Jim has had some academically talented students. There was Kemba Walker and Emeka Okafor. But Jim isn’t squeaky clean on grades & recruiting like Dean Smith. Jim is responsible for failing to comply with NCAA regulations. Eleven months ago, Calhoun received a 3 game suspension and UConn was placed on a 2-year probation. The team forfeited one scholarship. These punishments were for recruiting violations and for failing to create an atmosphere of compliance. 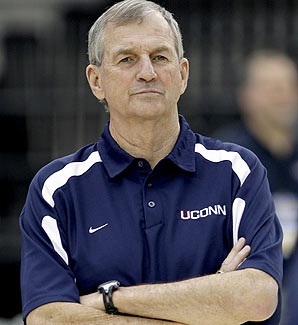 Jim has also for several years brought in academically challenged student-athletes who lowered UConn’s graduation rate. As a result, it’s nearly a foregone conclusion that UConn will be banned from the 2013 N.C.A.A. Tournament. Calhoun is ultimately responsible for accepting these ball players. Given that, it is a little creepy to think about how Jim has defended the low graduation rate at UConn by referring to some non matriculating players as having “graduated to the N.B.A.”. There is a dull odor of arrogance in that comment. There are some real pros and cons to Jim staying. If he leaves now he will damage the University’s recruiting capabilities. Taking away the N.C.A.A. Tournament AND the lure of being coached by a Hall of Famer is a double whammy. But, if he leaves now the wheels will be set in motion to build the program under a new Coach. If he stays, he can steer the ship away from the rocks and make ready for his successor. And, if Jim stays he will be a constant reminder of the 2012 banishment that 3.5 Million Connecticut residents will endure next year. Making matters worse, Husky Nation will likely see Lamb and Drummond leave in the NBA Draft. Next year could get ugly. My vote is to keep Jim in the job for two more years. Let him clean up the program and make the violations and academics a distant memory. Give him a chance to depart with dignity and in the manner of Dean Smith. In the long run, it is best to get the transition going. Thursday night Calhoun had a bunch of kids on the floor who (except for Shabazz Napier) did not want the ball in crunch time. Napier, and Walker before him, are exceptions. The last 6 years have seen a steady parade of Huskies that did not learn, improve, work together or step up. Jim’s lost something off his fastball. For sure. Glorious things come to mind when thinking of Bob Welch, the right handed power pitcher with a 211 – 146 record & 3.47 ERA over 17 years. He is the last major leaguer to win 27 games. He pitched in 4 World Series, earning rings in ’81 and ’89. 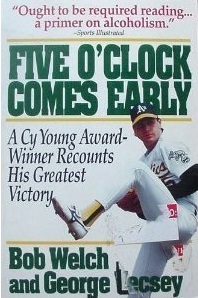 Welch is the winner of the 1990 Cy Young, trumping Roger Clemens even though his E.R.A. was 2.95 and Roger’s was 1.93. As a Dodger he played with Garvey, Baker, Sutcliffe and Fernando. As an Athletic he teamed with Dave Stewart, Dennis Eckersley, Ricky and Jose. 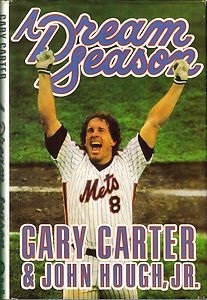 As a 21 year old, he struck out Reggie Jackson in the ’78 Series. I did not used to think of Bob Welch as a former alcoholic who was on a sure fire path to an early death. Doomed until Fred Claire and Tommy LaSorda intervened. Reading this book changed that perception. Five O’Clock Comes Early. A Cy Young Award Winner Recounts His Greatest Victory. Bob Welch and George Vecsey. (1982). 1991/Fireside edition. “Of course, the Welches are a drinking family.”, writes Welch. The Welches lived in Ferndale, MI and sent Bob to Hazel Park High School. His family came from Paducah, KY. They were driven by the Great Depression and WWII employment opportunities in the Motor City. The Welches came north in search of a better life. He remembers talking his first drinks at age 10 at a wedding, when he and a cousin guzzled down abandoned 7 & 7’s. He got drunk for the first time at age 15, when he chugged a bottle of Mogen David before attending a football game with a bunch of friends who each slugged down a bottle of pre-game booze. Young Welch’s daily passion for drinking became a daily habit early on. He suffered from frequent black outs, not remembering his verbal abuse of family, friends and strangers, or his physical destruction of property, or the embarrassing scenes in restaurants. By the time he reached the major leagues he was lost; a 21 year old reliever for Tom LaSorda’s Dodgers, drinking beer during games and kicking in hotel doors at night. Welch was set up to fail. He grew up in a drinking home. His habit grew unchecked until he was on the path of self-destruction. The search for a better life is Mr. Welch’s journey. Hazel Park kids were tough. They were greatly competitive in sports, and equally competitive when chasing women, drinking beer or playing pool. After a game, Hazel Park folk head for the Rainbow Bar to trade insults, cuss up a storm, eat pizza, and buy a round. “And drink some of those beers just to show I was one of the guys.”, says Welch. Raised on Howard, Giff and Dandy, bred on McLain, Kaline, Harwell and Lolich, Bob Welch was equal parts Detroit fan and local sports star. It wasn’t all about baseball, though. He loved to shoot the basketball. He was so confident that he sought games against black players in the city. He won the Detroit City P.A.L. Championship while moonlighting on the West Side Cubs. He was unable to sit still. He was an often injured kid. By the time he was 8, he broke his arm, fractured his collar bone and took 10 stitches in the head in 3 separate instances. Parrot fever threatening his life at age 11, causing a 39 day hospital stay and requiring Bob to wear drainage tubes in his ears for 1 year. His injuries persisted until his sophomore year in college, when he tore up his knee and committed to stop taking risks with his body. But, the Cubs took him in the 14th round of the 1974 draft and offered $5,000. “…hell, I could have cleared 5 grand selling marijuana in the neighborhood.”, wrote Bob. Welch chose college instead of the Cubs. Many schools wanted him, but Eastern Michigan State’s Ron Oestrike and Roger Coryell cared the most about him. Welch drank his way through EMU. He drank right through freshman and sophomore years and into the subsequent off season when he toured Japan with a college all star team coached by the famed Ron Dedeaux of U.S.C..
“You’ve got to stop drinking. You act just like an alcoholic when you’ve had a drink.”, Deadeaux told him. That was the first time anyone had confronted him about his drinking. He denied and deflected Dedeaux. But he never forgot what the Coach said. As a junior, Welch progressed well toward the June draft until his elbow exploded. Surgery was required. As he rehabbed, most of the scouts disappeared. All of them except for the Dodgers’ Dale McReynolds, that is. McReynolds kept showing up. He liked what he saw. He was picked by the Dodgers in the 1st round of the 1977 Draft. The team flew Welch to L.A.. They wined him, dined him and had Dr. Frank Jobe examine him. They suited him up for a tossing session at Dodger Stadium. Nobe Kawano gave him a uniform. He dressed silently near Don Sutton, Tommy John and Davey Lopes. His agent, Bob Fenton arranged a $55,000 signing bonus and off to AA San Antonio went Welch. After striking out many and walking few in the minors, LaSorda called up Welch. He debuted on June 12, 1978. He was still 21 years old. Lasorda used him in relief 10 times. He started Welch in 13 games. The pride of Hazel Park went 7 – 2, with a 2.02 ERA and 3 saves. Welch did not deliver an overall good performance in the World Series, but he did have his star moment when striking out Reggie. Welch would contribute in relief and as a starter in 1979, too, going 5 – 6, 3.98 with 5 saves. But he was displaying risky behavior. He learned that he could slip into the dugout during the game and down a can of beer before anyone noticed he was gone, or so he thought. In addition to getting a buzz-on during games, he showed up for games hammered. Team mate Rick Sutcliffe sobered him up more than once. Bob was getting drunk every day. He was drunk as soon as he had one drink. He frequently stayed up all night drinking. None of this was new. Bob had been acting this way since college. No one except Rod Dedeaux had said anything to him about it. That changed in January of 1980 when the Dodgers arranged an intervention. The rest of the story is about how Welch stopped drinking and faced his fears during an extended stay at an Arizona rehab facility. Hats off to LaSorda and Claire for making Welch the first participant in a newly established alcohol treatment program with The Dodgers. They saved his life. He owes the last 15 years of his baseball career and everything else to them. You’ll find the balance of the book honest, ugly and renewing. If you have a friend you suspect is an alcoholic this book is of special value. You’ll learn there are 20 questions. If you answer yes to 3 of them, you are an alcoholic. Baseball is life. Baseball is about so much more than just baseball. This is one book that proves it. This book is the story of how Bob Welch found a better life. Everybody loves Cinderella in March. I spent much of my weekend with several of them. By the time the weekend was over, I had attended a total of 3 different Division I conference tournaments and in every case the advance-or-go-home pulse of March basketball was beating. On Sunday, after the spiritually cleansing laundry duty and more physical labor, i.e., setting up a new mattresses, I drove to the Mass Mutual Center in Springfield, MA, Naismith’s town. There I saw the 7th session of the MAAC Men’s Tournament. Iona, the 1 seed. and winner 8 of 9, faced the 4-seed, Fairfield. The Gaels had defeated the Stags twice earlier in the season. This game should have just been a preliminary to next week’s final against #2 Loyola. Without a UConn dawg in the fight, my baseline interest level was mild. My interest spiked when Ryan Olander, brother of Tyler Olander, was announced as a Fairfield starters. Ryan O. beat Tyler O. on Dec. 22 in head-to-head competition at the XL Center. UConn downed Fairfield, 79 – 71, but Ryan’s 8 pts, 8 rebounds and 2 steals bested Ty’s 2 points, 2 rebounds and 2 assists. That day, UConn dodged a Fairfield bullet while being outscored in the second half 45 – 33. The Huskies were lucky to play poorly and win that day. That day, Ryan was the 4th best Stag after Desmond Wade, Eric Needham and especially after blue chipper Rakim Sanders. But, on this fine Sunday at the MAAC tournament, junior Colin Nickerson hit big the shots and big 3’s to rate as the top Stag. This up-and-down game featured hot trips, great passing, pressing defense. This was an in-your-face physical battle. It was mostly Iona’s game until the 6:00 minute mark of the second half. Iona’s Scott Machado and Mike Glover had their way until they lost their legs. Machado scored 24 and Glover 19. But when sophomore forward Keith Matthews hit a jumper for Fairfield with 8:41 in the game, the Stags grabbed their first lead of the second half, 61 – 60. And that is when Iona began to show fatigue. Notably, a wasted Mike Glover missed 7 out of 10 free throws in the last 7:52 of the game. The Gaels tied it briefly at 61 – 61, but they never led again. Fairfield stood steady while Iona crumbled, 85 – 75 the final score. Joy, mirth, color, bedlam and music. Cheerleaders. Pep band pumping. Down goes #1. Down goes the Gaels. Stags win. Stags win ! Part II of my Triple Tournament Weekend had concluded. Two-and-a-half hours later, Little Lee and I made our way up to the VIP seats at the Chase Arena at the University of Hartford. Below us, #1 seed Stony Brook was tied 55 – 55 with the Albany Great Danes, and 5 seconds left on the clock. This was the first game in the semi-final round of the America East Conference Tournament. We entered the half-filled 4,000 seat gym during a time out. The noise level was deafening. The game restarted. The ball was in-bounded. Stony Brook missed a jumper. Sea Wolf forward Dallis Joyner flipped in the rebound as time expired. Crowd explodes. The court is stormed. Cheerleaders. Pep Band pumping. The gym is rocking. It’s the experience desired from any level of March Madness, Division I, II or III. Sea Wolves move onto to the Tournament Final next week. Little Lee and I looked at each other, speaking no words, but recognizing the amazing event we had seen transpire. Our entertainment expectations were exceeded in the first minute we were there. Little Lee is my preferred partner in Basketball, as she also is in almost anything. Theatre. Movies. Dining. Cooking. Drinking Wine. Reading. Playing Golf. Little Lee is a College Basketball Queen. As a former cheerleader, she understands the game from having watched it from up close while at 25 games a year. As a UConn Mens Fan, she has passion and volubility; her Husky T shirt appropriately says “TRUE BLUE”. Even better, her record with winning office pools is tip top. She has won the March Madness picking three times and finished 2nd once in the last 6 years. I and my favorite companion sipped red wine and watched the #2 Vermont Catamounts tangle with the #4 Hartford Hawks in the second semi-final of the night. Little was expected out of Hartford, owners of a 9 – 22 record. But this match featured 26 ties and 11 lead changes. The largest lead by either team was 4 points. Hawk star guard Andres Torres fouled out after scoring the points in regulation to force overtime. The game was in doubt until there were 12 seconds ticked away. Hartford fell to Vermont in double overtime by a score of 77 – 73. We chose to step out of the Big East Mens hullabaloo and saw terrific D I basketball right in our own backyard. Never, never again ignore the College Tournament Basketball in our Connecticut/Western Mass home. Make a note. Put it in your CAL for ’13. 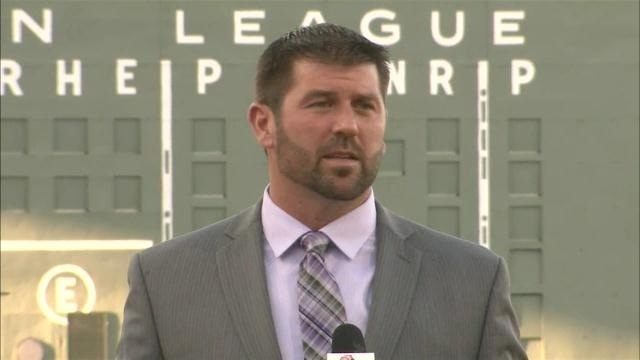 Jason Varitek hung it up 16 days after Tim Wakefield. The only team that would want this pair was no longer interested in either player. After 3 years of not hitting in the clutch and not throwing runners out, Tek was toast. I will never forget how Matt Garza threw it by the old catcher in game 3 of the 2008 ALCS. The Spitting Man struck out Tek with one down and runners on 2nd and 3rd. Jason was by then either too banged up or too weathered to have sufficient bat speed any longer. Those of us present at Fenway saw it so, so clearly. One of my friends can cite the day, dates, opponents and sequence of events for every game in which ‘Tek came up big. Guys like Mark Kantor of S.A.B.R. The details are burned into their memories. I’ll remember ‘Tek for select accomplishments. Like for surpassing Ray Schalk’s all time record for catching the most no-hitters by different pitchers. Tek’s record is four – Lowe, Nomo, Lester & Buchholz. He did not secure a fifth one only because Curt Schilling shook off ‘Tek with two out in the bottom of the 9th on June 7, 2007. After the shake, the A’s Shannon Stewart singled to right. Then Mark Ellis popped up to make the 27th & final out. Sox win 1-0 on a 1-hitter. Had he called a 5th no-no from a 5th pitcher, a HOF argument would have gained momentum. I’ll remember Tek for being a team player on the Queer Eye for the Straight Guy cable show, a special Red Sox edition episode. With pregnant ex-wife Karen skooched from the room, Tek quietly allowed himself to be waxed, groomed and dressed by the Fab Five as Carson drooled over Johnny Damon and Kevin Millar pronounced himself a big gay dude after the team transformation was complete. 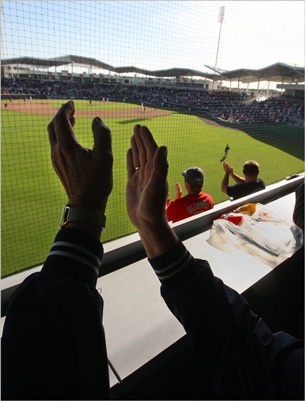 I’ll remember standing on the 2nd floor walkway in right field at Fenway, the one between Bleacher 43 and Grandstand 1, on July 24, 2004, watching Sox and Yankee relievers jump over the bullpen wall and run to the diamond where Tek was giving A-Rod a leather facial and a wrestling move. I’ll remember Tek leaping into Papelbon’s arms after catching swinging strike 3 for the last out of the 2007 World Series. I’ll remember Tek for not drawing criticism in his 15 Boston playing years. Fans loved him and felt nothing but sorrow when his skills declined. Ambush-prone radio talk show hosts let him be because they couldn’t find a character flaw. Team owners gave Tek a measure of respect until the end, overpaying him in 2009, 2010 and 2011, and never embarrassing him through his last unsuccessful contract negotiation. He was selfless. He was deep in his preparation and in his character. He is the all time leader in Sox games caught and respect earned. Thanks for staying in the family, Tek. Farewell — for now, Jason.